So first things first: the MX-5 Miata is still here. Despite the fact that I went through the trouble and expense of listing the car on eBay, I decided to end the auction a few days early because I decided that I really do like the car too much to just flush it right away. Besides, as my (older than her years) 10 year-old daughter told me, “it’s the wrong season to sell a convertible. You should really wait until the weather is nicer.” Smart aleck. 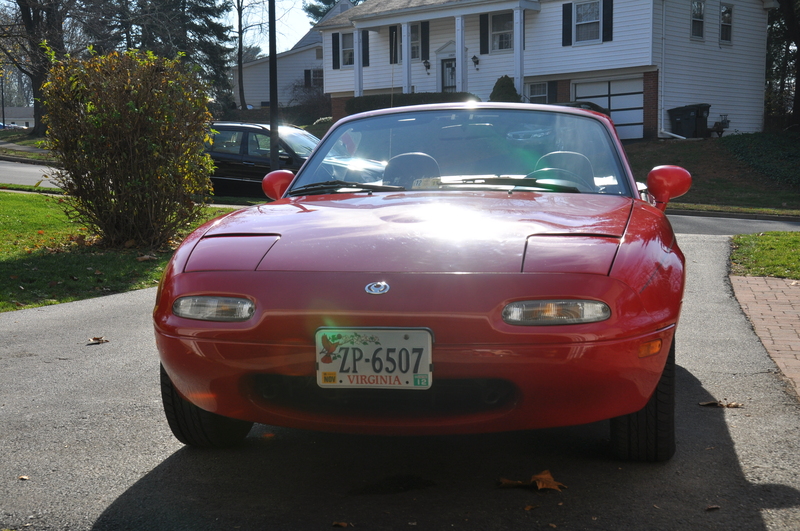 The main factor in the decision, though, was that I realized that I like Miatas in general, and they really are some of the most fun you can have for the money. Beyond that, I won’t soon find another in the same condition for the same money. In cars like the Miata, I usually prefer the motor for the soundtrack on a drive. Still, every so often it’s nice to turn on the stereo for a little background music, especially on a highway jaunt or on a particularly miserable top-up day. The cassette adaptor for my iPod that came with the Miata made that even more attractive, except that the speakers made an awful popping noise. I was quite the audiophile when I was a teenager, and even into my 20s. These days, however, my priorities are a little different and my money better spent in other places. So instead of paying $200+ for a top of the line speaker upgrade for the Miata, I went to eBay in search of used OEM speakers. Besides, fancy speakers would be somewhat wasted on the factory stereo, which I have no interest in replacing any time soon. I am a sucker for factory original. Fortunately, I located a set of speakers for the princely sum of $35 on eBay, and clicked “Buy it Now”. When I went to pull the door panels, I was immediately frustrated by the fact that I did not have the special tool necessary to pull the clip that secures the window crank to the door in order to remove the door panel. I started trying to fabricate a makeshift tool, but that didn’t work either. Then for some reason I can’t explain I went back over to the car and pulled on the plastic speaker cover. Lo and behold, it came off independent of the door panel. Duh. Lucky break, but made me feel more than a little stupid. What I found when I got the panel off was a speaker that had seen much better days – probably about 15 years ago. The cone was completely separated from the speaker as you can see in the photo, leaving no real question as to where the popping sound came from. 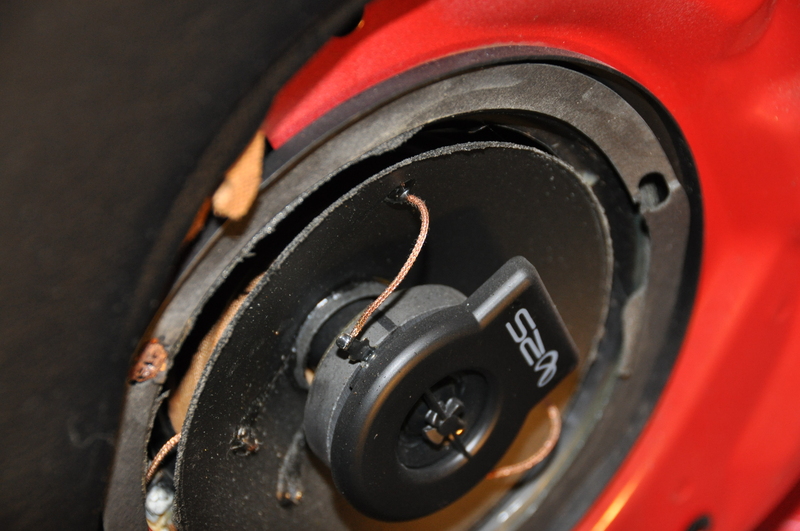 Whoever installed the aftermarket speakers had done a little bit of a bodge job on them, poking new holes in the sheetmetal to secure the speakers while at the same time (for some reason) discarding most of the plastic inserts to screw the retaining screws into. I dug through my trays of miscellaneous parts and found a few bits that would serve the purpose and wen about undoing the mess that a previous owner had been kind enough to leave me. The factory wire clip for the speakers was long gone, but with the help of a little electrical tape I was able to get everything connected securely. Before fastening everything back down and reinstalling the speaker covers I turned the key and turned on the stereo – and it sounded clear if not a little tinny, but remarkably like the Miata we bought nearly new in 1996. Success! So next up is a factory cockpit brace from a 1994 Miata that I have purchased used. I would have covered it this time, but there’s more to the install than I originally thought. Installation requires a little bit of cutting of the plastic behind-seat panels in order to fit and look right. I also need to purchase a couple of nuts, since the 1993s did not come with nuts welded to the body. Stay tuned, it may take a while to build up the energy for this one. 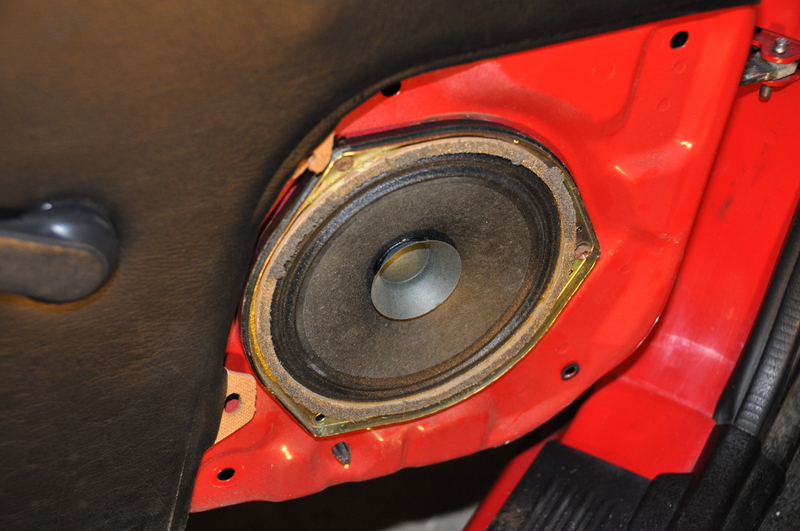 This entry was posted on Wednesday, January 25th, 2012 at 7:45 AM	and tagged with 1993, Mazda, MX-5 Miata, NA, Speaker Installation and posted in Fleet Update. You can follow any responses to this entry through the RSS 2.0 feed.